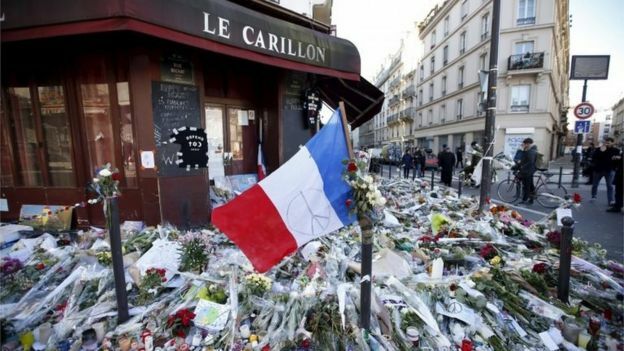 France is to hold a national memorial service for the 130 people who died in the Paris attacks two weeks ago. Friday’s service in central Paris will bring together 1,000 people, including President Francois Hollande as well as survivors and victims’ families. A minute’s silence will be held and the names of all the victims read out. Attackers with assault rifles and suicide belts targeted a number of sites in the capital. Islamic State later said it was behind the assault. In a series of co-ordinated attacks on 13 November, the gunmen opened fire on restaurants and bars in the city and stormed a concert hall, where 89 people were shot dead. During Friday’s service at the Invalides complex, President Francois Hollande will address the victims’ families. He has asked citizens across the country to “participate by decorating their homes with the blue-white-and-red flag”. “We have tried to suggest something that will let every French person take part in Friday’s ceremony,” government spokesman Stephane Le Foll said. However, not all the victims’ families have accepted the invitation to attend the service at the grand complex that houses a military museum and Napoleon’s tomb. The family of one victim told French media they had refused, saying not enough had been done to protect the nation in the wake of other attacks here earlier this year. At least nine people are believed to have been directly involved in carrying out the attacks.